The grant provides more than $130,000 for Blake Stringer, Ph.D., assistant professor of aerospace engineering in Kent State's College of Aeronautics and Engineering, to study propulsion systems for a new generation of intermediate-sized unmanned aircraft systems (UAS), commonly known as drones. "I would say that unmanned aircraft systems are becoming the disruptive tech of the 21st century in the aerospace and aviation industries," Dr. Stringer said. "This technology is really changing the way we function as a society. So how do we control them? How do we implement them? How do we use them? How big can they be?" Small consumer-grade quadcopters have been a favorite holiday present in recent years, while companies, like Amazon.com Inc., want to use them for package delivery. The military's options for moving people and supplies through the air, however, remain limited to airplanes and helicopters. In a collaborative effort with Army Research Laboratory consultants and researchers at the University of Tennessee, Dr. Stringer will assess the feasibility of creating a drone that is sized somewhere in between. "We're taking something between zero and 55 pounds, and trying to make it 1,000 pounds," Dr. Stringer said. "We want to make it so it's able to drop supplies off or perform some mission." "Maybe you have soldiers in an urban area clearing a building and they need to be extracted from a top floor on a high-rise building, or you're looking for something that can send supplies to a more remote area," he said. Dr. Stringer's project involves building an experimental test stand. "We'll put different sized electric motors and different sized rotors on it, and measure things like thrust, speed, thermal efficiency, acceleration, deceleration and vibration data," he said. "From that, we'll be able to determine how big is too big before we have to change the way we're constructing things. When you go to scale these things from this small arrangement to something big, the dynamics of the rotor change." "How do we efficiently produce power that's not around a gas turbine or a piston engine?" he said. "Is it going to be some kind of hybrid propulsion system? Will you have a fuel cell that feeds into a battery and uses the battery for surge moments? There are a lot of different questions." For more information about Kent State's College of Aeronautics and Engineering, visit http://www.kent.edu/cae. 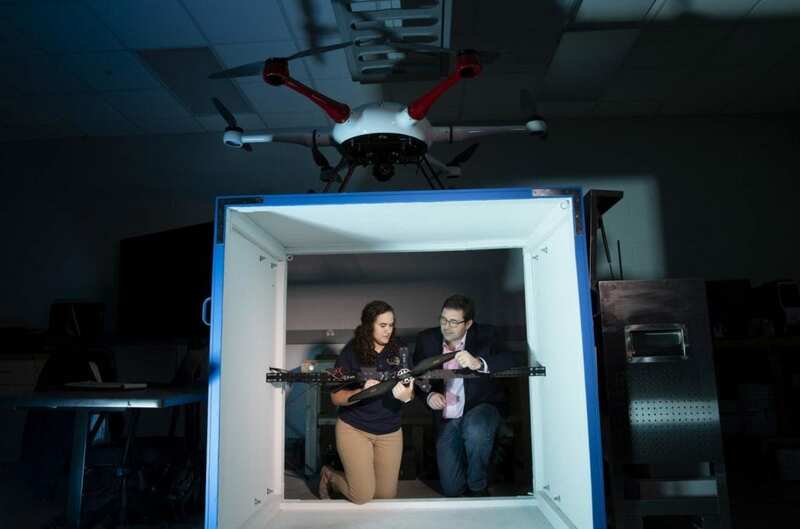 Blake Stringer, Ph.D. (right), assistant professor of aerospace engineering in Kent State University's College of Aeronautics and Engineering, and research assistant Kendy Edmonds study the power needs for a new larger generation of drones, seen above, for a research grant funded by the Army Research Laboratory.